From mysterious murals deep inside Paleolithic caves, to movable adornment for Renaissance merchants, art is something malleable, reflective of the space and time in which it exists. Art was one thing when it was made for the magnificent churches of Venice, like San Marco and San Lorenzo, and became another when it was created for fine palaces like Versailles. While over the past two centuries we’ve become accustomed to going to the commercial gallery or the nonprofit museum to look at art, we have known, at least since the time of the Dadaists’ Cabaret Voltaire, that there are almost as many ways to experience art as there are to make it. One of the most viable if elusive ways to experience art in our own time is the pop-up gallery. Rather than being represented by a third party or institution, today an artist like Salt Lake City’s Sarina Villareal may lease an open space, put her name on the shingle and create her own gallery, if only for a few hours or, in this case, months. The aesthetics of the gallery are on a level with credible galleries in the most art-saturated cities, and has a look and feel of professionalism. 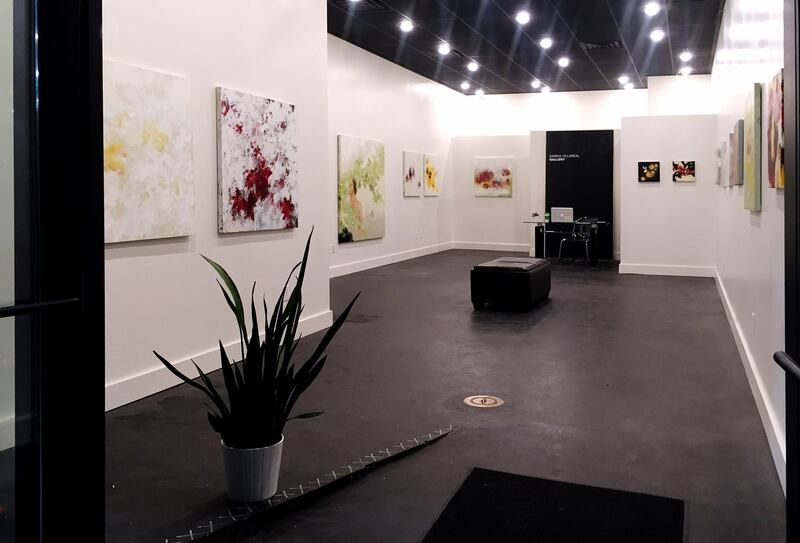 The paintings, gallery wrapped and without frames, pop off the bare white walls, the blacks of the gestural marks complementing the charcoal gray concrete floors. Its location and timing couldn’t be better. The gallery opened in October, in time for the grand opening of the nearby Eccles Theater, which Salt Lake City hopes will redefine the neighborhood. It will remain open during the holiday season, taking advantage of a time when Main Street is at its busiest. Villareal has contributed her talent to the Salt Lake City art community for much of her young life. 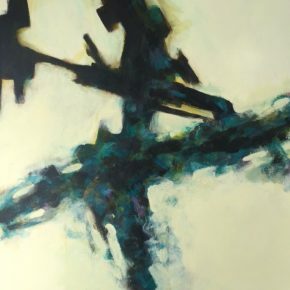 In addition to being marketing director at the Utah Museum of Contemporary Arts, she is a talented painter who has had a number of strong shows in the past few years. She has a unique way of approaching her subject, which might be called exploratory, or scientific. Her process combines an interest in nature—flora specifically—aggressive abstraction, and theories of time and durations of memory and memory loss, ultimately begging the question of absolutism or relativism in experience. Comprehensively, Villareal’s work registers on a visceral note, as aesthetic intrigue, suspense even—an emotionally-based cognitive response. Villareal chooses to examine her subject through memory rather than observation in an effort to document “memory loss and deterioration.” These themes have been pervasive throughout her professional career, prominent in her first showing at 15th Street Gallery in 2012, where she was and is still represented. 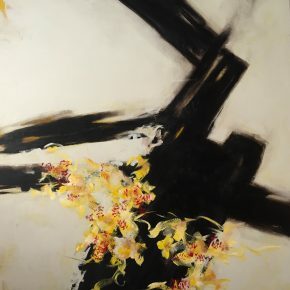 Villareal has traditionally used the human figure in an abstracted form, rendered partially unintelligible as it is entwined and entangled or entirely swallowed up by floral motifs. In her new collection of work, displayed in the fore of the gallery space, the figure has been eliminated. 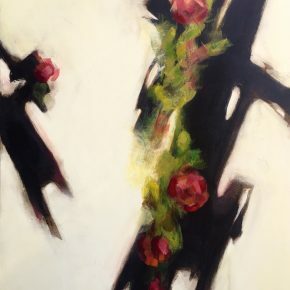 As a development from the previous work, what is seen might be read as nihilistic, the ephemeral nature of the flora now being crushed in Franz Kleinesque black swipes across the canvas, aggressively devouring the essence of the flora as it had previously reduced anatomical form to abstraction. This work is impressive, visually and conceptually, showing a mature and formidable force in the art community. Sarina Villareal Gallery is located at 149 South Main Street. It will be open through December 21.